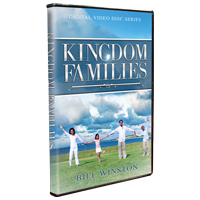 In Kingdom Families Dr. Bill Winston digs deep into the Bible to reveal the Godly purpose for marriage and the power available to husbands and wives through the anointed Word of God. The institution of marriage was created and ordained by God Almighty. It was His desire to create an earthly representation of himself through Adam and Eve. Let the revelation shared in this timely teaching series empower you and your spouse to enjoy one another in your holy union by exercising all of the principles and power of God by becoming one of the victorious Kingdom Families!